Gary Henricksen has never met Bernie Sanders. His Putney marketing-services business is located 140 miles from the presidential candidate's Burlington campaign headquarters. He won't even say if he's voting for the Vermont senator who would be commander in chief. But the owner of Five Maples is feeling the Bern — on his bottom line. His business is booming, thanks to Sanders' presidential bid. Five Maples, which coordinates Sanders' fundraising mailings, is one of 200 corporations, organizations and individuals in Vermont that have done business with Bernie Sanders' presidential campaign, according to the candidate's campaign finance reports filed with the Federal Election Commission. "I would call it very beneficial," Henricksen said. "Last year, they were our largest customer." As he seeks the Democratic nomination for president, Sanders has essentially created his own pop-up Vermont business, employing 105 people with Vermont addresses (from full-fledged staffers to short-term interns) and 1,125 employees nationwide. According to a Seven Days analysis of his spending records through January, Sanders had paid $637,763 in salaries in Vermont and $6.2 million nationally since launching his campaign last May. Around the country, the Sanders' campaign had spent $80.8 million before the first vote was cast February 1, compared to Hillary Clinton's $95.9 million. A small portion of that — 4.51 percent, or $3.6 million — went to entities with Vermont addresses. His local expenditures included staff, office rent, food, taxis and postage for a whole bunch of campaign mail. But in the grand scheme of Vermont's economy, Bernie Sanders Inc. is a fairly small fry, according to Patrick Walsh, an associate professor of economics at Saint Michael's College. "It's much more comparable to a decent-sized restaurant or a niche manufacturer, of which Vermont has many," he said. 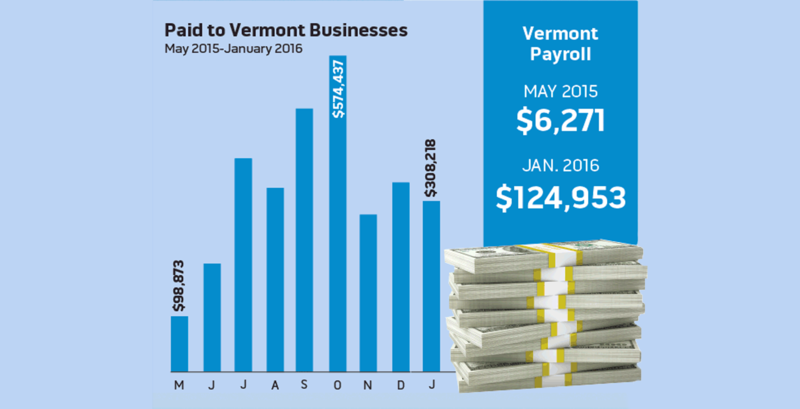 The business Sanders does with Vermont companies likely has more impact on the local economy than his payroll does, Walsh said, but it's still akin to a small firm. While Sanders Inc. is no GlobalFoundries or University of Vermont when it comes to workforce impact, "It can't hurt," said Senate Finance Committee chair Tim Ashe (D/P-Chittenden). "For the last year, unquestionably, it's provided a little boom to the downtown economy." Sanders' campaign has bought Leonardo's pizza ($804 worth) and Bruegger's bagels ($354) and dined on food from Rí Rá Irish Pub ($488), Istanbul Kebab House ($469), Leunig's Bistro & Café ($438) and the Farmhouse Tap & Grill ($1,672). 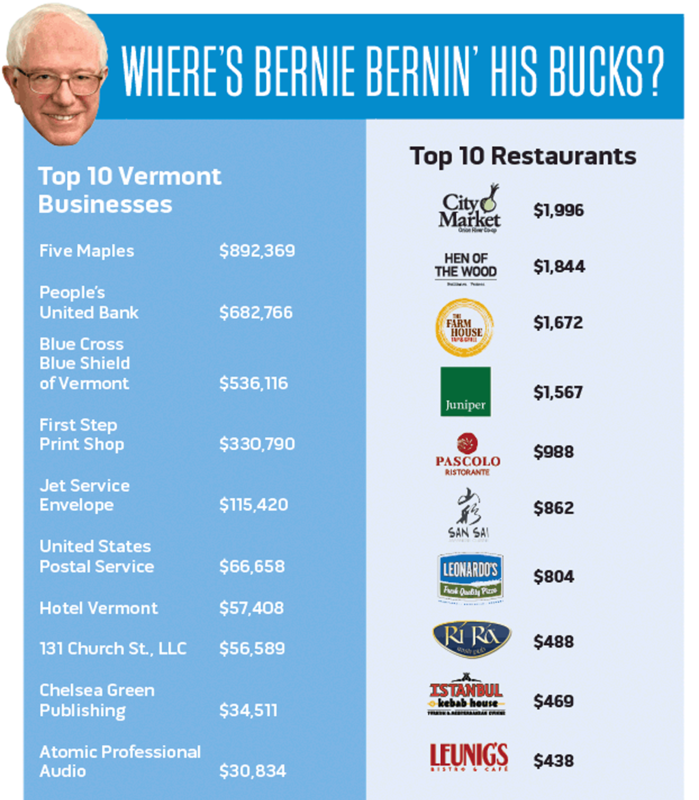 Sanders paid $536,116 to Blue Cross Blue Shield of Vermont for employee health insurance, spent $672 on Green Cab VT taxi fares and dropped $57,408 at Hotel Vermont, the upscale downtown Burlington inn. What happens at Hotel Vermont stays at Hotel Vermont, however. General manager Hans van Wees remained discreet about doing business with the Sanders campaign. "We never disclose anything about potential guests," he said. Sanders' campaign, busy bouncing from Minnesota to South Carolina to Texas in pursuit of the presidency, did not respond to an inquiry about his hometown spending habits. But the FEC report showed a $6,930 expenditure to Burlington Department of Public Works to lease parking spaces in city-owned garages. The campaign paid Burlington Parks, Recreation & Waterfront $5,640, the police department $648 and the fire department $210 to use the city's Waterfront Park for his May campaign kickoff. Around downtown, the campaign money is not exactly flowing, but the buzz about Bernie has brought some people to the city where he launched his political career as mayor 35 years ago. Bob Conlon, co-owner of Leunig's, said he doesn't know who from the campaign ate what or when at his restaurant, but he does know he's given directions to a fair number of tourists looking for Sanders' campaign office just down Church Street. "It can't hurt business in Burlington," he said. "It's like Ben & Jerry's. They come to see where it started." But Conlon added, "It's nowhere near the impact of the captive insurance convention every year. When they're in town, every restaurant knows it." Conlon did notice when he lost a waiter to the Sanders' campaign last summer. "I was surprised somebody could get a full-time job with a campaign," he said, noting that Sanders has surprised a lot of people. "He's done better than I thought." The better Sanders has done on the campaign trail, the more attention his hometown gets, which is good for Burlington, said Ron Redmond, executive director of the Church Street Marketplace. This week, as Sanders held his Super Tuesday watch party at the Champlain Valley Exposition in Essex, legions of national media showcased his home state. "It's probably as effective or more effective than all the tourism money the state spends," Ashe said. Sanders has been having that kind of effect for decades, said Ashe, who worked for the then-congressman in the early 2000s. "People used to call and say on the phone to Bernie's office that they moved to Vermont because of Bernie ... because it's the type of place that would elect Bernie," Ashe said. Sanders has walked the walk on some of his spending, pairing payments with his political philosophy. He does business with Vermont's only union print shop and supports local businesses from Burlington's City Market/Onion River Co-op to P&P Septic Service. Long an advocate of the U.S. Postal Service, Sanders has spent at least $1 million on postage. The campaign has gone out of state for some items. It bought $945,119 of material from DemSign, a national company with offices in Washington, D.C., and Texas that claims to have the nation's cheapest union-made lawn signs. Sanders has spent some of his money at national retail chains, including Lowe's, Home Depot and Amazon. And he reported $2,569 worth of business with Uber, the car service that is considered unfriendly to labor unions because its drivers are independent contractors. None of the companies profiting from Sanders' presidential campaign has any way of knowing how long the gig will continue. Another week? Another month? Until November? But they are happy to have the business while it lasts. Until then, the Sanders campaign will continue to provide Five Maples with lists of names and addresses that the Putney firm sorts and stuffs into fundraising mailings. So-called direct mail is still a part of most campaign strategies in 2016. Sanders had paid Five Maples $892,369 by the end of January, according to the FEC reports. That makes the company Sanders' No. 1 Vermont vendor. A 15 percent uptick in mostly Bernie business has allowed Five Maples to add two workers to its 20-person staff, according to Henricksen. "We've been quite pleased and grateful that Bernie chose to keep business in state," said Henricksen, whose company has worked with Sanders since his 2012 Senate campaign. Henricksen reports that the Sanders campaign pays its bills and doesn't micromanage the work. "They always keep their word," he said. Closer to the candidate's hometown, First Step Print Shop in Underhill has also enjoyed the fruits of Sanders' campaign. According to the FEC reports, Sanders had given the company $330,790 worth of business through January. The only union print shop in Vermont produces business cards and letters for Sanders. The letters are then sent to Henricksen's Putney shop for sorting and mailing. Bob Martelle, who owns First Step with his wife, Mary, said they've worked with Sanders for about a decade. They also did business with former governor Howard Dean's 2004 campaign. "This is our second presidential election," he said. Bob Martelle said the six-employee company has added one full-timer and occasional part-timers to help with the increase in business, but he said First Step can still handle more work as Vermont's state election season ramps up. The work is more than routine for First Step and its employees, Martelle said: "We're all Bernie supporters."